U.S. equity averages posted their first weekly loss in the past seven weeks as gains on Thursday and Friday failed to overcome the effects of the worst pullback in oil prices since November. Crude oil prices slumped 9.1% last week to the mid-$48/barrel level after U.S. production grew at the fastest pace in over a year, swelling inventory to a record for four straight weeks. Stocks ended the week on a positive note after strong gains in the labor market cleared the path for the Federal Reserve to raise interest rates during their upcoming Federal Open Market Committee policy meeting March 14-15. Investors are increasingly viewing a March rate increase as a sign of confidence in the U.S. economy. For the week, the S&P 500 fell -0.4%, the Dow Industrials lost -0.49%, and the MSCI EAFE (developed international) rose +0.42%. Immediately after the U.S. Presidential election, emerging market (EM) assets underperformed developed market assets (DM), with the former seeing outflows of $27B through the end of November. This occurred as speculation mounted around better economic growth in the U.S., stemming from the new administration’s policies, drove both yields and the dollar higher. This, in turn, initially caused fears that we may see a repeat of 2013's "taper tantrum." Yet despite the immediate pullback, EM equities and bonds have both recovered their losses and are outperforming DM year-to-date. But with the Federal Reserve appearing much more hawkish and a rate hike in March all but certain, why is it that EM assets continue to outperform? 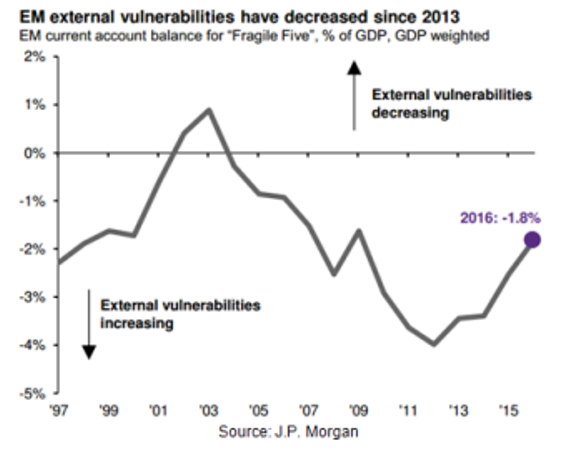 The main reason, according to J.P. Morgan, is that EM countries have much stronger economic fundamentals than in 2013, when large current account deficits were funded by massive inflows of foreign money that immediately reversed at the announcement of tapering. Additionally, EM currencies were highly overvalued prior to the "taper tantrum," whereas now they are somewhat cheap relative to their 10-year average. With external imbalances much more in check than in 2013, and with domestic fundamentals improving in several countries as well, EM assets should weather policy normalization in the U.S. better than they did in 2013.